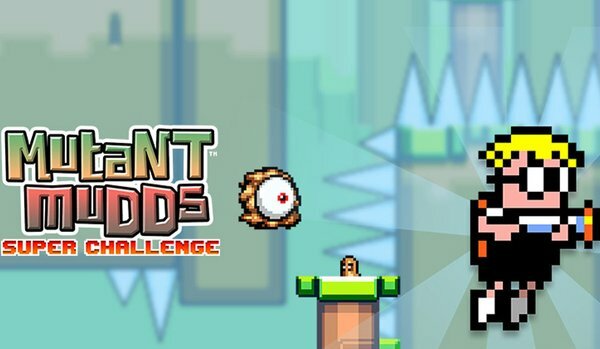 Welcome to the official discussion thread for Mutant Mudds: Super Challenge on the 3DS! To start, please add this game to your log, add it to your collection (if applicable), and (when you are ready) rate it using the link above! So, Max returns in the anticipated sequel to an early eShop hit, Mutant Mudds. These alien creatures have come back for more, and it's up to Max (and 20 other unlockable playable characters) to defeat this menace and bring peace to the world! This game is intended for players who have already completed the original Mutant Mudds - because this is not an easy game. Expect to be challenged from the get-go in this new action platformer. So get going! The world needs to be saved! Start blasting those mutants into oblivion! I'm a little tempted, but I'm not sure that this game series needed to be HARDER. I think i'm getting too old for nail biting hard. CONTRARY TO WHAT THE DATABASE SAYS, THIS GAME IS NOT ON DS - IT IS ON 3DS! No internet right now so I can't download it. But I'm considering it. Well I went ahead and bought it. Hope it doesn't make me frustrated at the difficulty or anything. /EDIT Wow that was the fastest download ever! I assume if you own the original it uses that game's assets and just downloads the new stages or something?! Died about 40 times in the first 3 stages. It's not too bad though, I mean, like half those deaths were while trying to collect optional stuff. How does cross buy work? You get a code for the other version when you buy. @GameDadGrant Wait, is this a code you can give away? Because honestly without save syncing I don't think I'll ever play the other version. I went with the 3DS version just because I need more to play on 3DS right now. Also WHERE do you get a code?! Also also, how do you unlock the bosses in this game?! Finished the first four stages but the boss is still locked. The code is in your eShop receipt when you purchase the game. As for the bosses...did you get the secret stage in 1-4? And all 100 gems in each stage? And no I didn't do all of that. Yeah, receipt. Go to the eShop, scroll all the way to the left (top row). Click on "Setting/Other." Scroll down to "Account Activity" and click on that. Scroll down to where it says you purchased Mutant Mudds: Super Challenge and click on "View Receipt." Finally, scroll ALL the way to the bottom of the next screen, and at the very bottom is your eShop code for the Wii U version. And yes, you can give it away if you like. I bought this on the 3DS. I'll give my code for the Wii U version of the game to the first person who wants it! Hmm, me too... that's two codes! Maybe we should make a thread giving away codes for this game, we can't be the only two. Or even if we are, no one will see it here since most people coming into this thread probably already have the game. Did you find the secret door in 1-4? I'm getting frustrated trying to locate it. That's the one I'm stuck on and can't find but I only gave it one shot yesterday. Oh one thing that bugs me about the design of this game, or games in general really, is when they include moving platforms but that they're never properly synced with other moving obstacles ahead so that you either have to wait it out before their movements line up or that you take a risk and get hit. There's been a few so far and just sitting there waiting isn't really fun. Whyyy do devs not fix these things? Hmm. How often has that happened? I've put several hours into the game so far, and it hasn't happened to me. At least, not often enough for me to take notice? Just a few times in one level. Nothing to lose my mind over but it's happens more often than it should in platformers.